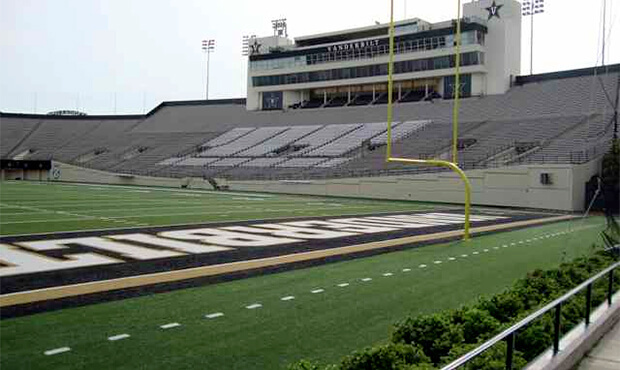 Vanderbilt Stadium in Nashville will be the new site of the 2014 Masters of the Summer Music Games DCI Tour event. A delayed stadium field construction project at Middle Tennessee State University's Johnny "Red" Floyd Stadium in Murfreesboro will cause the relocation of the July 25 Masters of the Summer Music Games DCI Tour event. The competition, which is set to feature the Bluecoats, Blue Devils, Phantom Regiment, Santa Clara Vanguard, Carolina Crown, Boston Crusaders, Cadets, Cavaliers and Music City, will be moved to the urban campus of Vanderbilt University in downtown Nashville. "Though we'll be taking a year hiatus from our longstanding location in Murfreesboro, we're excited to be able to keep the same date and lineup for this event, just move it 45 minutes north into the heart of Nashville," DCI Director of Events Susan Kuehnhold said. The relocated Masters of the Summer Music Games will be hosted on Friday, July 25 at Vanderbilt's 40,000-seat stadium. Home to DCI Tour events several times in the 1990s, the facility underwent an $18 million renovation in 2011 that included the construction of additional seating and the installation of a synthetic playing surface. "For those who joined us for the 2008 World Championships in Bloomington, Indiana, the sightlines at this facility remind me a lot of Memorial Stadium," DCI Executive Director Dan Acheson said. "We're grateful to both the Vanderbilt University band staff and athletic department for responding to our very last minute request to stage one of our most popular events of the summer." Patrons who have already purchased tickets to the Murfreesboro event will receive a complete refund of their purchase from Ticketmaster. Tickets for the new Vanderbilt event will go on sale to the general public as soon as details have been finalized. View additional event details.